Biography: Dawn has enjoyed teaching and coaching for the last 20 years. Currently, she is an instructor at Mt. Hood Community College where she teaches courses in Health, Fitness/Conditioning, Nutrition, as well as Fitness Swim classes. Dawn also works with individual clients on strength and conditioning through her business Fit Focus. 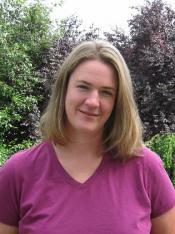 Dawn began swimming competitively for Mt Hood Swim Team when she was 6. During high school she stayed busy with water polo and track in addition to swimming. She also taught swim lessons and coached swimmers of all ages (team and private) throughout high school and college. She earned a BS from Oregon State University in Exercise and Sport Sciences with a minor in Health and Nutrition, and an MA in Education with a specialization in Motor Learning. After college Dawn worked for 4 years as a teacher with the Reynolds School District and coached Swimming and Water Polo at Centennial High School. When not on the pool deck, Dawn enjoys training for â€œ runs, rides and open water tri'sâ€, camping, and hiking, with her husband and kids.